I hate getting anything greasy on my hands. That includes moisturizer, sunscreen, olive oil, margarine, and butter. Until recently I had reserved myself to living a life of dry toast and flavorless corn-on-the-cob, but then a one-trick kitchen gadget came along with exactly the one-trick I desperately wanted. You might assume there are only two types of people who would want a gadget like the Biem Butter Sprayer, which turns sticks of butter into sprayable deliciousness. People dealing with physical challenges who find it very difficult to spread butter with a knife, and picky people like me who hate getting their hands greasy. But that’s a cynical approach to a gadget that sprays butter! Aside from salt and pepper, butter is easily the most delicious thing you can add to any dish. And with the Biem, you can easily accent any meal with liquid gold, as easily as you’d shake salt and pepper on it. Not every kitchen needs this device, but anyone with taste buds should want one. My first reaction when unboxing the Butter Sprayer was how gigantic the gadget was. I wasn’t expecting something tiny, but the Biem towers over even the largest water bottle I have. It stands almost 11 inches tall, which means you can easily store it on your counter, but stashing it in your fridge overnight might be a challenge. The Butter Sprayer is also quite hefty, thanks in part to the components that melt and pump butter, but also due to the 2,000 mAh replaceable battery that’s inserted into the bottom of the unit. To charge it, there’s an equally massive external charger, which I unfortunately couldn’t use with any of the outlets in my kitchen because it was so tall. That was frustrating, but I do like that the Butter Sprayer includes two batteries so you’ll always have a fully charged spare on hand for emergency butter situations. Forget about storing your Butter Sprayer in a kitchen drawer, it’s a hefty gadget. Loading butter into the Biem was even easier than its battery. The top of the sprayer unscrews with a quarter turn, revealing a deep rectangular cavity that’s perfectly sized for a standard stick of butter. You’ll still need to touch the butter to insert it (or use a pair of tongs, like I did) but once the lid is sealed again, your work is done. The Biem works with both salted and unsalted butter sticks, but also any food oils like coconut oil, olive oil, and even margarine. The Butter Sprayer’s external charger and batteries are huge, but it includes a spare you can always keep charged. When you’re out of butter (gasp! ), indicated by a blinking LED light, cleaning and prepping the Biem for the next stick is just as easy. You just fill the chamber with slightly soapy water, start a cleaning cycle, and then blast all those liquids out. I was worried it would be a messy endeavor, negating the conveniences of the sprayer, but cleaning the contraption is mostly effortless. Bye-bye solid butter, hello delicious butter mist. The Butter Sprayer’s warming mechanism starts automatically when you pick it up, thanks to a motion sensor detecting the movement. But to maximize battery life, you have to press a button on the back of the device to start the reservoir pump and prep it for spraying. On average, the Butter Sprayer takes about a minute to get ready to spray, and a little longer when coming straight out of the fridge. That’s not exactly instantaneous—you can melt butter in the microwave in less than 10 seconds—but the Biem trades a little bit of patience for a whole lot of convenience. The hardest part of using the Butter Sprayer is waiting for the butter to melt. When the button on the back stops flashing, pressing a second button on the front of the Biem starts the spraying. As someone who dislikes butter getting everywhere, I like that the sprayer’s trigger button remains sealed under an outer-layer of silicone, ensuring any splash-back won’t get into the device’s inner workings. The trigger button is protected under a layer of silicone that’s easy to wipe clean. As butter is sprayed, it’s also cooled, so as not to cause burns if it lands on skin. I was worried the Biem Butter Sprayer was just another expensive kitchen contraption that wouldn’t deliver on its promises of easy butter delivery. It’s undoubtedly a unitasker, as Alton Brown would say, but one that does its single task remarkably well. There’s clearly a lot of design and engineering that went into its creation, maybe even over-engineering, but the result is a butter-spraying gadget that’s easy and reliable to use. 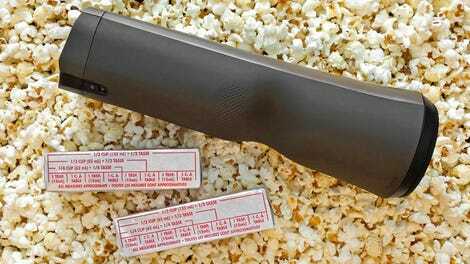 Perfectly buttered toast, and lightly buttered popcorn. There is one thing I’d like to see improved, however: overspray. 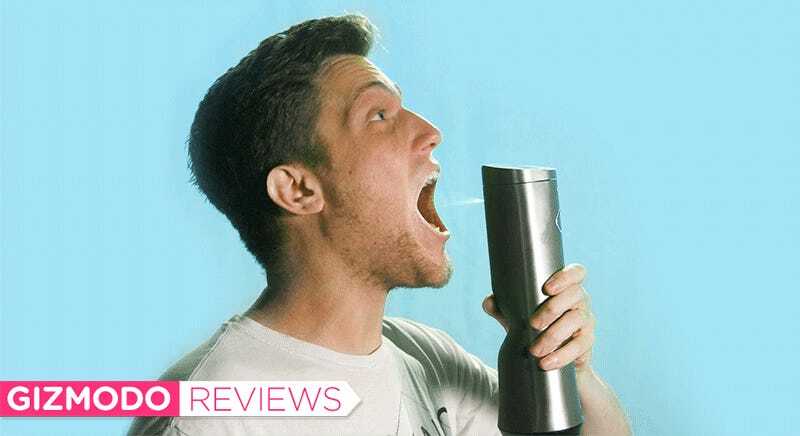 Rarely have I had to chance to review a perfect gadget, and unfortunately the Biem Butter Sprayer has one major flaw: It’s usually hard to see where butter is going as it’s being sprayed. The device does include a small LED light above the nozzle that helps illuminate the blast, but it’s not enough. My first attempt to butter toast from edge to edge also resulted in a butter-soaked plate, which is a mess you have to clean up, AND wasted butter. Maybe the inclusion of a laser diode creating a simple round target would improve things, but as it stands you’ll want to first practice with the Biem over a sink a few times before targeting your dinner. It will take some practice to properly butter a slice of toast without overspray. Do you need the Biem Butter Sprayer in your kitchen? Few people do. It falls somewhere between a novelty and a luxury, but maybe closer to the latter with its $130 price tag. Do you want the Biem Butter Sprayer in your kitchen? Of course you do. Dedicated kitchen contraptions like Margarita-makers and bacon toasters are a waste of countertop space because you simply don’t use them for every meal. 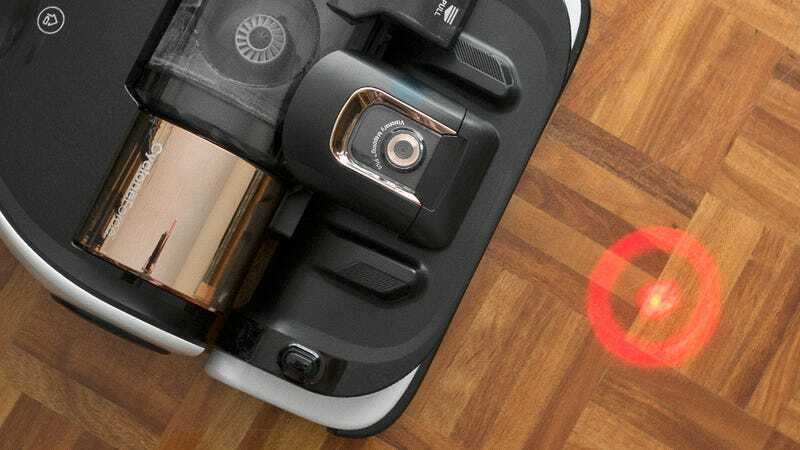 But butter goes on everything—from waffles, to grilled cheese sandwiches, to baked potatoes—and with the Biem always close at hand, you can upgrade every meal with just a squirt. Is this a must-have gadget? No. But it does what it’s designed to do very well. With practice, the Biem Butter Sprayer makes it extremely easy to neatly butter toast, corn, popcorn, or anything else improved with butter—which is everything. About as easy to use as a kitchen gadget can get, it works reliably, and it’s equally easy to clean. It’s just a well-designed product. $129 is expensive for a kitchen gadget with just one job. Makes it easier to properly portion butter, but just as easy to over do it. Also works with olive oil, coconut oil, margarine, and any edible oil product, so get creative. If you hate greasy fingers, you’ll unfortunately still have to touch butter every time you reload the Biem. Includes two swappable rechargeable batteries so you always have a backup. Do you really need to upgrade your kitchen?